Continuing with this summer’s botanical series here’s a very tasty wild fruit that you have probably never heard of though species grow in Alaska, the Lower 48 and parts of Canada. I can attest that the Saskatoon makes for great pies and syrup. They can be added to cereal or muffins, dried as “raisins,” or just eaten fresh. The Saskatoon tastes rather like a blueberry with almond added. There are several species in North America. At least one species is native to every U.S. state except Hawaii and to every Canadian province and territory. Two species also occur in Asia, and one in Europe. Amelanchier species can be anywhere from about six inches to sixty feet tall. The origin of the generic name Amelanchier is probably derived from amalenquièr, amelanchièr, the Provencal l names of the European Amelanchier ovalis. Members of the rose family, Amelanchiers are related to hawthorns, crabapples, cherries, plums, and peaches. The various species of Amelanchier are known by several common names: shadbush, shadwood, shadblow, serviceberry, sarvisberry, wild pear, juneberry, sugarplum, wild-plum and chuckley pear. Pigeonberry was once also used. The name serviceberry comes from the similarity of the fruit to the related European Sorbus (Ash); it is also said that their flowers heralded the roads in the Appalachian mountains becoming passable, which meant that the circuit-riding preachers would be coming soon and church services would resume; also, that the ground was thawed enough to dig graves, and funeral services could be had for those who died over the winter. Shadberry refers to the shad runs in certain New England streams, which generally took place about when the trees bloomed. The name Saskatoon originated from the Cree Indian name misâskwatômina (misāskwatōmina, misaaskwatoomina) for Amelanchier alnifolia, the species found in the Pacific Northwest, western Canada and Alaska. In some areas the Serviceberry was included in pemmican, a combination of minced dried meat and fat, as a flavoring and preservative. Amelanchier plants are preferred browse for deer and rabbits. Caterpillars of various moth species, as well as various other herbivorous insects feed on Amelanchier. Saskatoons are harvested commercially and several named cultivars have been developed. 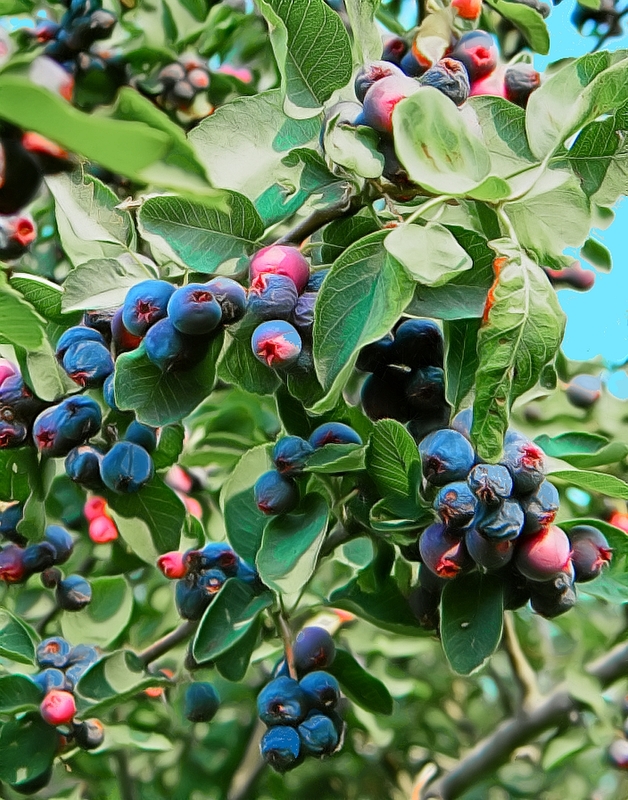 Canadian growers are promoting the Saskatoon as a superfruit. Saskatoon berries contain significant Daily Value amounts of total dietary fiber, vitamins B2 (riboflavin) and biotin, and essential minerals, iron and manganese, a nutrient profile similar to the content of blueberries. Saskatoons also contain significant amounts of polyphenol antioxidants, again, similar in composition to blueberries.